I don't eat a lot of candy, but I l♥ve Butterfingers. When I saw this recipe on the Taste of Home forums, I knew I had to give it a try. Everyone on the board said it tasted just like a real Butterfinger. The best part - this recipe only has three ingredients! 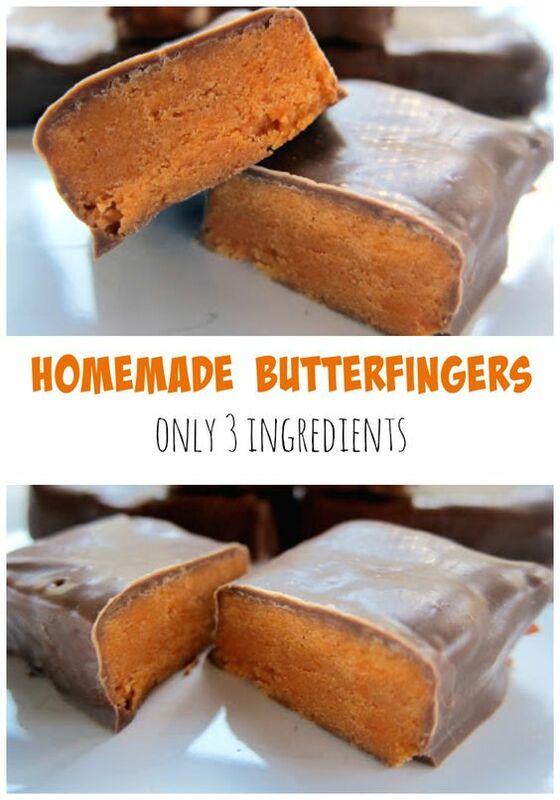 How can you make a Butterfinger with only three ingredients?? Well, the secret ingredient is candy corn! Actually, it is melted candy corn. I would have never thought to melt candy corn, but it turns out that melted candy corn mixed with peanut butter transforms into something amazing! We were shocked at how great these tasted and how close they are to real Butterfingers. I had to give most of these away so we didn't eat them all by ourselves. This is one of the best homemade candies that I have ever made. I think these would be cute made into suckers for the holidays. I am going to look for some Christmas tree candy molds and give it a try. This is a great way to use up any candy corn you have leftover from Halloween. So get to it! Melt candy corn in microwave on high 1 minute. Stir and continue cooking in 15-second intervals til melted, stirring after each interval. Stir in peanut butter. Spread mixture in an 8x8 pan lined with parchment. Cool completely. Cut into squares. Dip cut candy bars in melted chocolate candy coating. Lay on waxed paper to set. Is the peanut butter center flaky like a Butterfinger? Or does it just taste like a Butterfinger? Wow! This is a must try recipe!! I love butterfingers too and this recipe resembles a dessert that I had as a child in the public school system in Colorado. YUM! @Haggermaker4 - they aren't as flaky as a Butterfinger, they just taste like a Butterfinger. They spot on flavor. I know a Butterfinger nut who is doing to love this. Who would have though, dang candy corn! I can't believe i missed this , i am a Field Editor for Taste of Home! Wow!! Thanks so much for sharing this! I love fun unusual recipes and candy making, this is a must try!! Y'all have leftover candy corn? How can that be??? Wow... great and unusual recipe. Oh my goodness, are you kidding me? I've seen lots of remakes of candy, but would never even have wondered if this one was done. Looks and sounds de-lish. Must check Halloween clearance items! Candy corn? Who knew? It looks dangerously amazing! I love butterfingers! i made these yesterday (11/11/10) on my day off. they smelled DELISH!! i've not yet tasted them but will be diving in today! I don't eat candy bars but I think your idea of making them into "pops" for the holiday a good one. I hope you share once you've worked it out. If they're easy enough I might make 'em to send in to school along with some other stuff. These are really good I have made them several times. But now I have run out of candy corn. Do you know where I can get it this time of year? Melissa - I believe that I have seen candy corn at Wal-Mart and Walgreens year round. I am actually looking for some today too! Really? Melted candy corn?? :) They look great, even without the flaky texture. I just found this on Pinterest! Who would have thought? I have got to try this just because it sounds so unusual with the melted candy corn, but I do love butterfingers. Jenn - thanks for stopping by the blog! I am totally addicted to interest. Interesting---I so dislike candy corn but LOVE Butterfingers so I'm excited to give it a try! Found you off Pinterest and made these days for my boyfriend's birthday. They are his favorite candy! I made it on the stove vs. microwave (sleeping baby that I can't bother!) and I think it worked well. Tasted the candy corn/pb mixture and it was GOOD. Can't wait to taste a full one! Thanks!!! Made these yesterday. I used Smucker's Natural smooth peanut butter, since it's the only kind I keep on hand. When the mixture cooled, it was flaky just like the kind you buy. I think it was probably due to the pb. A pb with added sugar would add to the sweetness, but by the time the chocolate was added, this recipe was perfect! So easy and soo yummy! WHO HAS CANDY CORN LEFTOVER AFTER HALLOWEEN?? At my house, Candy Corn never even MAKES it to Halloween!! Thx for the recipe! Can't wait to give it a try! No one in our house likes candy corn, but will definitely buy them for this recipe. We all love Butterfingers. I wish it had the same texture as Butterfinger candy bars though.... I love the flakey, chewiness of them. I will be on the hunt for some candy corn... good thing Halloween isn't too far away! We like candy corn for about a day, then we're sick of it. I can't wait to give this a try with all the leftovers. Great post. What a intriguing recipe! I would love these. I love that they use leftover candy corn! I would love for you to join my linky party (Crazy Sweet Tuesdays). Hope to see you! These look fantastic! I will definitely be giving them a try! It doesn't turn out well if you use reduced fat peanut butter. It still tastes great, but gets way too hard way too fast and isn't workable or cutable. Gotta use full fat. I repinned this yesterday and so far my repin tally is at 97!! I can't wait to try it!! I finally made this delicious recipe and I can't believe how much they taste like a real Butterfinger candy bar! I had to make a few changes to the recipe based on my lack if pantry items. I also linked your recipe and blog to my post! I'll be sick from eating too many of these by tomorrow morning!! They taste sooo good! Thanks Steph! Were yours rock-hard? I made them yesterday using natural peanut butter and they are break-a-tooth hard! Wonder if adding more peanut butter would make them softer. I just wanted to say a huge thank you! Found the recipe on Pinterest and was so excited as I have a peanut/tree nut allergic child so I figured Butterfingers were something she'd never get to experience. With recipes I can tweak them for her...and the same rang true here! After some hunting I found safe candy corn and made them using Sunbutter. I am sooooo excited to give her a try of Butterfinger deliciousness that won't send her to the hospital! I'm waiting for the mixture to cool so I can cut and dip. Thank you, thank you, thank you! I'm so excited about these! I have a daughter that is allergic to dairy and peanuts, so no candy bars for her. I can however make something like this with an almond butter sub and dairy free chocolate. She'll get to have something similar to a butterfinger! OH man these are my favorite candy of all time! This will be a great treat for my girl who's on a gluten free diet! I am writing a blogpost about these. May I use on of your pictures and credit it back to your blog? Did anyone just use melted chocolate chips or did everyone go with chocolate candy coating? Hi LW, I used a mixture of dark and semi sweet chocolate chips. It worked perfectly! I've posted my version of Plain Chicken's recipe to my blog made with chunky peanut butter! Were yours rock-hard? I made them yesterday and they are break-a-tooth hard! I wonder if using more peanut butter would make them softer. I too found these on Pinterest and decided I would be crazy not to give them a try! However, I used Kroger brand peanut butter with HONEY in it! :) I just finished mixing them and letting them set up. I haven't put the chocolate on yet, but they are soooooo delicious so far!! I bought all the ingredients and I'm trying this hopefully tomorrow. I can't wait. I've made these a few times now and they are amazing! if you're looking for more of the flaky texture add a bit more candy corn to the mix. I shape mine into the bottoms of mini muffin tins to set and then dip them in chocolate. They're great! What a fun idea! I was about to throw out our leftover candy corn, but this is a much better option. I have not tried this yet, but I plan to soon! I just wanted to offer another "easy" fake butterfinger that I have made in the past and found to be great also. My version is probably a closer match on the "texture" of a real butterfinger. It is simply 2 ingredients, no cooking. Just dip Lance (or similar brand) cheese peanut butter sandwich crackers into melted coating chocolate. Yummy! Fat Cat DJ's - that is a neat idea! I am going to try it! Thanks for the recipe! I made them and the family loved them. Posted about them here. We're making these right now. Can't wait to try them! Thanks! What is chocolate candy coating? Is it just milk chocolate chips melted? Thanks! I looked it up, and 16oz peanut butter = 1 and 3/4 cups. Thank you for this recipe! This sounds delish, but no candy corn left here....lol! Is it even still available in the stores or is there a substitute? I have had to hunt down candy corn in the past for Thanksgiving recipes. I usually end up finding it at a truck stop. :-) They carry those bags of candy that are like 2/$1.00 Anyway hope this helps anyone who can't find it at the local grocery store! I cannot WAIT to try this recipe! Do you know good place to buy candy corn year round? Thanks for sharing! Oh yum! I'm definitely keeping this recipe in mind! I made these and they were crazy good. The taste is exactly like the candy, but you are right about the texture. I can't wait to try this! TY! Made these tonight. They are absolutely spot on! After reading the reviews, I used Jif all natural creamy peanut butter. I had a 12 ounce bag of brach's candy corn (it was leftover from Halloween - and the candy corn had gotten a bit chewy - not sure if this affected why they turned out flaky with the right texture) instead of using 1 1/2 cups peanut butter (the conversion to match the 12 ounce candy corn), I used 1 1/3 cups. It was actually really hard to stir and the candy corn took a surprisingly long time to melt. But once I was able to stir it, I added the peanut butter and then microwaved it 1 more minute to make sure it was all melted and mixed together well. From there, I followed the recipe and used chocolate almond bark...SOOOOOOO good, just like butterfingers! Ok, that does it. I keep clicking through from Pinterest and most of the times I do (blog unknown), it's to you! That settles it -- I obviously need to add you to my RSS Feed! Please do Kate! You don't want to miss out on all the goodness! Hope you'll stop by and see us! Wow these sound great and I can't wait to try them..... Love you site. I'm a new blogger and am loving finding all these great blogs. You can add a tablespoon or two of vegetable shortening to chocolate chips for the shiny chocolate instead of candy melt! These look really good! Butterfingers are my absolute favorite candy bar. I'm amazed all it takes is candy corn and peanut butter. As soon as I find some candy corn I'm trying this!!! I just made these. Mine didn't melt to well so I ended up pouring it on a lined cookie sheet. Once it cooled a little and they were still really wet, I tried forming them into pops. When those cooled I dipped them in chocolate. The texture for me came out pretty close to the real thing. Made these and they were fantastic! For those who want a little crunch (like I did), try adding in about 3/4 c. Of cocoa krispies into the candy corn/pb mix. Added just the right amount of texture and crunch. These are better than the 'real thing'. I don't know what I did but this was terrible. It didn't melt right then the pb wouldn't mix in. Just when I thought I had it, it is so hard that it won't cut. I think I will stick to buying butterfingers. I just made these and mine tasted just like the real thing. Mine were flaky just like Butterfingers!! So good and the taste was right on! Anyone have any hints for working with the chocolate bark? I always end up with a sticky mess...although it tastes great, I would like for it to look more appealing. Thanks! If you add a touch of shortening or butter it will be shinier and smoother. But don't add too much or the bark won't set! Or, you can try candy melts (usually near the bark in the store). I think it's nicer-looking. Just add more peanut butter to get it flakier. Then it is more like a real butterfinger. I also used a mini-muffin tin (sprayed with oil) to shape them. I ran a knife around the edge to take them out-- good idea to set them all on edge before you start dipping, because it gets REALLY messy. I dipped each piece in chocolate (melted choc chips with a smidge of butter added) and set them on waxed paper. I got cute little Halloween mini cup holders and they are GREAT! Use a natural PB to make it flaky-er. And popping them in the freezer seemed to make them a little more flaky too. Very Yummy and the kids loved them. Some advise for those having trouble with the melted coating. Here what I do to get a good looking piece of coated candy. 1. I stick a sheet pan lined with wax paper or parchment paper in the freezer before I start the candy melting. 2. I make a double-boiler for melting the coating. I take a quart saucepan, add an inch of water in the pan and bring to a simmer on the stove. Once the water is really hot, but not boiling, I put a heat proof bowl on top of the pan of water and add the coating. At this point you can turn the stove off. Stir until melted. 3. I use a skewer and stick it into the candy square & dip to completely cover with coating. Use a couple of forks if you don't have skewers. Make sure to let the excess drip off. Place on cold sheet pan and chill until set. Some people are saying that the candy corn was not melting right & the candy came out like a rock. If your using the microwave (various wattage) when in doubt, set the power to 50% & stir the candy every minute or so until melted. This will keep the sugar from burning and make it easy to stir in the PB and result in a candy that won't break your knife or teeth. Hope this helps the novice candy makers out there. It is a sin to waste sugar & fat deliciousness!!!! These are easy and tasted just like butterfinger! They were even slightly flakey! I know I will make these again and again, thanks! I used HEB candy corn and Peter pan creamy pb. THESE WERE AMAZING..I was shocked at how easy this way...Thank you SO MUCh for the recipe!! OK, when they put the candy corn on clearance the day after Halloween, I'll be there! What is chocolate candy coating, and where can I find it? You can find chocolate candy coating at Michael's or Hobby Lobby in the cake decorating section. I like to use chocolate almond bark - I find it near the chocolate chips at the grocery store and Wal-Mart. These are just amazing. You won't regret trying them out. Check out my post about it. Thanks Steph for an amazing recipe. This is not a vegan or vegetarian recipe. Candy Corn always contains Gelatin which is pigs fat. @jwassom - when I made these, it made about 20 candy bars that were approximately 1" x 1" x 4"
@Unknown - you are correct that this is not a Vegan or Vegetarian on the grounds that Candy Corns almost always contain gelatin which is made from animal products. Gelatin is not, however, made from pig or any other fat. It consists of collagen which is a protein and not a fat. http://en.wikipedia.org/wiki/Gelatin Thanks for pointing out that this contains animal products. We should all be more aware of what is in the things we eat. I have made these before and they are to die for! Has anyone ever made them using the "pumpkin candies"? Or have a recipe using pumpkin candies? I have a bag I would like to use up. I tried it tonight using autumn mix (candy corn mixed with the pumpkin candy). About half the candy had been in a covered dish since Thanksgiving, so maybe the moisture content was low, or maybe the density of the pumpkins was too high, but it didn't want to melt well. Part of it actually seized on the side and bottom of the glass dish I was using. Adding the peanut butter helped blend it into a malleable grainy mess, so it's currently in a pan cooling. Wow...How crafty lol. Gotta love Pintrest!!!! Replace candy corn with marshmallow. This is getting pinned so my wife can see! If you can't find Candy Corn in the stores, you can find a recipe to make your own at Pinterest.com. Just type "Homemade Candy Corn" into the search box and take your pick. I read that people are having trouble melting candy corn...how long does it take to melt candy corn? Any tricks? Anyone know how many servings this makes? I want to add this to my Christmas candy trays but an 8x8 pan doesn't seem like it would yield much. I guess it depends on how big of a square you cut.